Nathaniel “Jules” Johnson’s first New York disc I’ve Been A Long Way From Home was a real screamer featuring a barnstorming vocal full of righteous fire – love the screams of pain. And although the production was pretty “small label” the horns complemented the pumping organ and guitar licks to good effect. 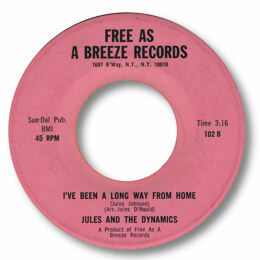 His second 45 under the control of “Bowlegs” Miller in Memphis should have been even better, but sadly “Take A Little Time” was a rather anaemic ballad not helped by a rather “little girl” background harmonies. 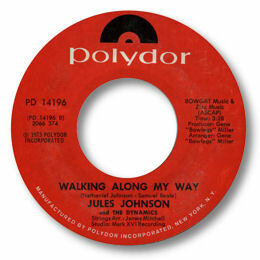 I prefer the mid tempo Walking Along My Way which has a better melody but Johnson’s vocal is well throttled back and lacks the fire of his previous effort apart from the occasional snarl on the chorus.Like all his other releases Johnson’s final effort “I Just Want To Thank You” was self-penned but despite his best efforts this Big Apple ballad just doesn’t cut it. The song just isn’t strong enough sadly.